#3 - Pirate Life IIPA Pirate Life shocked the Aussie craft beer scene with their 3 core beers all placing in the first 11 places in the countdown. Their IIPA was the highest placed beer, coming in at #3. In my mind it is far and away the best Imperial IPA brewed in Australia. It has that malt sweetness that so many of it's highly lauded American counterparts have, whilst also packing a monstrous 120 IBU's of tropical fruit and citrus bitterness. #17 - Feral War Hog I would like to think that my ravings about this beer helped earn it 17th place in the Hottest 100. When War Hog was fresh it was the juiciest IPA I can recall having. The hops are full of tropical fruit and citrus flavours, with passionfruit and grapefruit the most prominent. Like all things Feral do, it's sensational! If you haven't tried this beer yet, get your hands on it! It's incredible and I think there is a new batch! 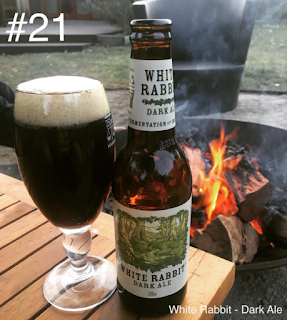 #21 - White Rabbit Dark Ale Ask non-beer drinkers to name a dark beer and the majority will say Guinness, ask them to name an Australian dark beer and often the answer is White Rabbit Dark. I'm often surprised how many of my macro lager drinking friends are quite partial to one of these. I can see the appeal; it's wonderfully roasty, with some dark fruits flavours and just a touch of hop bitterness. As winter rolls in, this definitely goes higher up my list of beers when out an about. #21 is about right, it's a wonderfully consistent beer that you know you can trust. #41 - 4 Pines West Coast Red Rye IPA 4 Pines have been producing some magnificent beers with their Keller Door range recently. The West Coast Red Rye IPA was no exception to this rule. It wonderfully blends the orange and tropical fruit of the hops, with some thick almost treacly malts and hints of rye spiciness. If this beer had been released later in the year, I'm sure it would've finished higher up the countdown - I loved it! #53 - Hawkers Pale Ale I love this beer, #53 is far too low down for this fantastic Pale Ale. It was one of two kegs we got through over Grand Final Weekend last year. It's an incredibly sessionable Pale Ale with a light biscuity malt base. The hops are quite bitter for the style with orange, tropical fruits and floral hints the main detectable flavours. It finishes wonderfully dry, just making you want another; and another... This is a beer I'm predicting to go flying up the countdown next year! #67 - Two Birds Sunset Ale It's been a couple of years since I've had a Two Birds Sunset Ale. After sampling it, I'm surprised I waited so long! It's a wonderful Red Ale, with plenty of nice caramel & biscuity malts along with hints of nuttiness balanced beautifully by the hops. The hops are predominantly citrus driven, with grapefruit dominant, while tropical fruits like passionfruit are also present. It's a very easy drinking Red Ale and one I will be drinking more of in the future. #75 Exit #010 West Coast IPA This was one of the beers I was worried about finding heading into this challenge. Before the recent release of their core range, all Exit beers were brewed just once. Thankfully I saw that Forester's Beer Hall had a keg on and popped in for a pot after work one day. It's a sensational IPA, with a light biscuity malt base complimenting the real stars of the show; the hops. There's plenty of citrus, resinous pine and even a hint of spiciness. I love Exit, and I believe this is my favourite of theirs yet! #86 - Rabbit & Spaghetti The Fox Lager I have to thank the guys at Naked Wines for helping me get my hands on their beer. The story behind this beer is very interesting and can be found in this link and this link. I really enjoyed the beer, it didn't have quite as much rye as I'd hoped it would, but did have plenty of fruitiness and hints of citrus. It's a very easy drinking lager, and one I'm quite looking forward to having a few more of! #100 - Bad Shepherd Hazelnut Brown Last position in the NFL draft is referred to as Mr Irrelevant, Normally players selected in this position don't amount to much, the same cannot be said of Bad Shepherd's, one of the newest additions to Melbourne's craft beer scene, Hazelnut Brown. It's a wonderful Brown Ale with great malt joined by a distinctly hazelnut nuttiness. It's very smooth and is a beer that I will be looking to sample plenty more of during the winter months. Aussie glassware is pretty sporadic once you get past the big boys. There should be some Aussie branded stuff popping up throughout this segment.